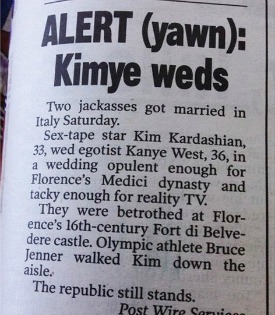 Did the ‘NY Post’ Go Too Far With Its Kimye Wedding Announcement? The 'Times' did a number on Guy Fieri's restaurant review in 2012. But this is very different. As everyone knows at this point, Kim Kardashian and Kanye West were married this past weekend in an opulent wedding ceremony in Florence, Italy. A lot of people care about this. A lot of people do not. A lot of people will talk about it even if they have mixed-to-negative feelings about either of these celebrities or the two of them as a couple. Less ambiguous are the feelings of The New York Post, who went full snark with their wedding announcement, seen at right. The Post is known for its over-the-top coverage of even the most serious of subjects. But this seems a little too much, even for a well-known tabloid. Personally, I’m happy for the couple, I clicked to look at the first images from the wedding (it looks quite nice actually) and I wish them well. Otherwise, I don’t pay too much attention to what they’re doing on a regular basis. That said, there are a lot of people who do keep tabs on #theworldsmosttalkedaboutcouple, so it stands to reason that a media outlet would cover them. And while some sarcasm is fine given who they are and how they present themselves to the world, this crosses the line to downright insulting, first with the lede about “two jackasses” and second with the job descriptions of the bride and groom. Whether you like them or not, Kim has done much since the infamous tape. And Kanye West is a legitimate award-winning musician with great talent and a wildly creative mind. Ultimately, the Post is a news organization, and while it’s the kind of paper that can get away with a certain amount of sarcastic commentary mixed with its news coverage, the tone of this is just a little too biting. Besides that, as Jim Romenesko points out, it’s kind of hypocritical seeing as how the paper covers a fair amount of Kardashian news.